New. 043396292291 (Shelf 38-6 GS SEALED) Item includes case and original artwork/insert. Please Note: Pictures may be catalog/stock photos and NOT an actual picture of the actual item being sold. If you are looking for a particular cover art or edition, please ask BEFORE buying. Typical transit time for standard media mail is 7-10 business days. New. 043396292291 **FACTORY SEALED** Your purchase benefits those with developmental disabilities to live a better quality of life. New. 043396292321 fast shipping excellent service. Meryl Streep, Amy Adams, Stanley Tucci, Chris Messina, Linda Emond. 2009 Run time: 123. New in shrink wrap. Ships fast with tracking. 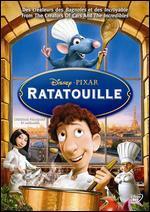 I loved this movie it was great from beginning to end. 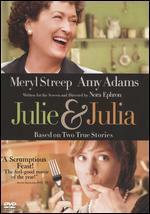 Merle Streep is fabulous she did a exceptional job portraying Julia child. 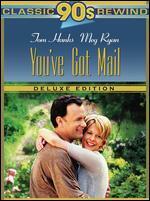 An outstanding and delightfully funny and moving film. 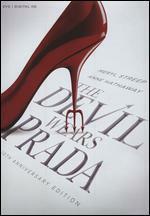 enjoyed every minute of this film. Once again Meryl shows us how great she is. A feast literally and figuratively. This film is the entwining stories of two women who strengthen their creative forces through cooking, but not just cooking, more gourmand delights. They are separated by over fifty years and the advance of technology. In 1948, Julia Child accompanies her husband (Stanley Tucci) to Paris for four years, takes a Cordon Bleu course, and with a friend, writes a book which becomes the bible of the aspiring American housewife. Julie Powell (Amy Adams), young wife and working girl, is so admiring of Julia Child that she decides to go through the whole 524 recipes in one year, and begins a blog writing down her experiences, her struggles, her successes. The plot moves quite nicely between the two women, one creating and publishing a cooking encyclopaedia almost, and the other using the net to publish her own year of cooking. The sets and music are superb, with the costumes taking us back to that more correct way of dressing that was the 1950s: hats galore, chic suits and high, high heels. A delight for the senses, the film rushes by almost too fast. I gather Meryl Streep's performance is 'spot on' as the exuberant, eccentric and charismatic Julia, although it sometimes takes a moment or two to meet the challenge of the variation from the more moderated Julie. But the film is a feast. 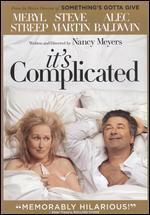 I just love Meryl Streep. Everything she does in great. 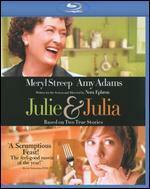 She packed on pounds for this role...but it gave so much pleasure to see and hear "Julia Childs".